Magnetometer is used across several industries due to use of magnetic field sensors. There has been increasing focus on technological innovation and new investments are also done to manufacture advanced & diverse magnetometer. Additionally, Magnetometer has diverse applications such as surveyors, energy, healthcare monitoring, pipe line monitoring, natural calamities, industrial, defense & aeronautics, and consumer electronics. Currently, surveying instruments holds the largest market share as it is used widely across globe for surveillance purpose in geographical exploration. The magnetometer market is anticipated to grow at a CAGR of 8.7% during the forecast period from 2017 to 2025 to reach US$ 13.66 billion by 2025. In 2016, the global magnetometer market revenue was pegged at US$ 8.25 billion. The magnetometer market is segmented on the basis of technology, product type application and by form factor. On the basis of technology the market is classified as Scalar Magnetometer and Vector Magnetometer. The market on the basis of product type is segmented into Single Axis, 3 – Axis, 3 Dimensional. Magnetometer market on the basis of application is segmented into Surveyors, Energy, Health Care Monitoring, Pipe Line Monitoring, Natural Calamities Research & Monitoring, Industrial Defense & Aeronautics and Consumer Electronics. Further, magnetometer market on the basis of form factor is segmented in fixed form and portable form. In 2016, technology segment vector magnetometer accounted for share contributing to US$ 4.78 billion of revenue generated in the overall market. It is also expected to hold maximum market share between 2017 and 2025, exhibit a 6.72% CAGR during the forecast period. This is mainly due to the rising demand of magneto-resistive technology across the globe followed by squid and fluxgate technology. In 2016, in terms of application consumer electronics accounted for more than 20% of the total market share. This segment is anticipated to showcase a CAGR of 8.21% during the forecast period. Defense and aeronautics is the second largest shareholding segment which is predicted to grow at the CAGR of 7.07% during the forecast period. Predicting outcomes application dominates the magnetometer market with the CAGR of 9.74% by volume during forecast period. This is mainly due to the rising demand of low cost magnetometer sensors usage in consumer electronics. Consumer electronics segment held the largest share followed by defense and aerospace segment. Defense and aerospace is the second-largest industry accounted the market share for more than 18% in 2016. However, healthcare industry is the fastest growing segment during the forecast period followed by media and entertainment. Regionally, North America held dominance in 2016 as the region boasts significant presence of prominent players in the market. Among nations showing lucrative prospects, the US has emerged at fore on the back of significant technological advancements witnessed in the last few years. Growth witnessed in this regional magnetometer market is pumped by the increasing investment across diverse industries such as defense and aeronautics, consumer electronics among others. Around the same time, Europe emerged as the second-leading market for magnetometer around the world. The rising use of magnetometer in aerospace and automotive industries are expected to result in the higher adoption of magnetometer in Europe. The key players dominating the magnetometer market globally include Bartington Instruments Ltd, Cryogenic Limited, GEM Technologies, Geometrics, Inc., Honeywell International, Inc., Infineon Technologies AG, Foerster Holding GmbH, Lake Shore Cryotronics, Inc., Lockheed Martin Corporation, NXP Semiconductors N.V., Scintrex Limited, Marine Magnetics Corp., Tristan Technologies, Inc., and VectorNav Technologies. The Magnetometer Market report provides analysis for the period 2015–2025, wherein the period from 2017 to 2025 is the forecast period and 2016 is the base year. The report covers all the major trends and technologies playing a key role in Magnetometer market growth over the forecast period. It also highlights the drivers, restraints, and opportunities expected to influence market’s growth during the said period. The study provides a holistic perspective on the Magnetometer market’s growth throughout the above mentioned forecast period in terms of revenue (in US$ Mn), across different geographies, including Asia Pacific, South America, North America, Europe, and Middle East & Africa (MEA). The market overview section of the report demonstrates the market dynamics and trends that influence the current nature and future status of this market. An attractiveness analysis has also been provided for every geographic region in the report, in order to give a thorough analysis of the overall competitive scenario of the Magnetometer market. Moreover, the report provides an overview of the various strategies adopted by key players present in the market. Product definition and introduction chapter helps in understanding different technologies of energy storage systems along with their applications which are included in the report. The report segments global magnetometer market on the basis of technology, product type, application, form factor and geography. On the basis of technology, the market is segmented into scalar magnetometer, vector magnetometer. The market on the basis of product type is segmented into single axis, 3 – axis, 3 dimensional. On the basis of application magnetometer market is further split into surveyors, energy, health care monitoring, pipe line monitoring, natural calamities research & monitoring, industrial defense & aeronautics, consumer electronics. Furthermore, Form Factor segment is sub segmented into fixed, portable. Thus, the report provides in-depth cross-segment analysis of the magnetometer market and classifies it into various levels, thereby providing valuable insights at the macro as well as micro levels. 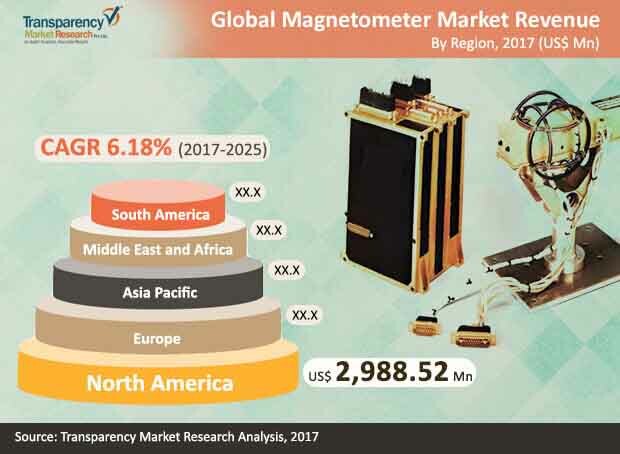 The report also highlights the competitive landscape of the magnetometer market, thereby positioning all the major players according to their geographic presence and recent key developments. The comprehensive magnetometer market estimates are the result of our in-depth secondary research, primary interviews, and in-house expert panel reviews. These market estimates have been analyzed by taking into account the porter’s five forces and value chain along with the current market dynamics affecting the magnetometer market growth. On the basis of country, North American market is divided into The U.S., Canada and Rest of North America. Similarly, Europe market is divided into Germany U.K., France, and Rest of Europe. Asia Pacific has been segmented into China, Japan, India, and Rest of Asia Pacific. Middle East and Africa covers the G.C.C., South Africa and Rest of Middle East and Africa. Similarly, South America region includes Brazil, Argentina and Rest of South America. This report provides all the essential information required to understand the magnetometer market and its growth factors. Also, the report provides insights related to the opportunity analysis according to the various geographical regions mentioned above. These opportunity analysis are directly or indirectly influencing the magnetometer market. Furthermore, porter’s five forces analysis explains the factors which are currently affecting the magnetometer market. This report also provides the ecosystem analysis for the energy storage systems which explains the participants of the value chain. Bartington Instruments Ltd, Cryogenic Limited, GEM Technologies, Geometrics, Inc., Honeywell International, Inc., Infineon Technologies AG, Foerster Holding GmbH, Lake Shore Cryotronics, Inc., Lockheed Martin Corporation, NXP Semiconductors N.V., Scintrex Limited, Marine Magnetics Corp., Tristan Technologies, Inc., and VectorNav Technologies are some of the major players operating within the global magnetometer market profiled in this study. Details such as financials, SWOT analysis, business strategies, recent developments, and other such strategic information pertaining to these players have been duly provided as part of company profiling. The magnetometer market is segmented as below.